Itch to Stitch Lisbon Cardigan – No Buttons though! – Nice dress! Thanks, I made it!! Sewing this knit together was not difficult. I used a narrow zig zag on my sewing machine. I do not like raw seams showing on my RTW cardigans, but there is not much I can do about that, so when I make my own cardigans, I try to make the insides neat! I bound the armscye seams in single fold bias tape. I sewed my side and arm seams by placing one side of the sewn seam into the other folded side of the seam and zig zagging the two together again – stronger and neater – sort of like a flat felled seam without the topstitching. When it came to sewing on the facings, I did not do them as instructed. I sewed one side of the interfaced facing to the bodice front by machine and folded and pressed the other side of the facing to the inside, handsewing it in place. I get a bit of stiffness in my right hand if I do too much hand sewing – I love sewing machines! They save my hands! – so I spread the handsewing out over a couple of nights. Now that I’m finished, I noticed that my shoulder seams seem a bit too long. Perhaps I could have made my Lisbon a size or two smaller? Or could it just be the stretch in this knit fabric? Next time I might try a smaller size. On this one, I could use some bias tape to reinforce the shoulder seams so they don’t stretch… I’ll see if that helps! Notice I don’t have any buttons or button holes yet? Apparently, I have 1 1/2 cookie tins full of buttons (mostly given to me by my Mom) and yet I cannot find 7 matching buttons for my Lisbon. So a button shopping trip is in my future! Seriously, what do you do with 1 1/2 cookie tins full of mostly “single” buttons? The inside is so nicely done you could almost wear it reversed. I also like the grey/black combination. Thanks! It’s a pretty cool fabric, isn’t it! The Lisbon is one of my favourite patterns. Why not try a narrow shoulder adjustment? I need to do these quite often. I really like this fabric and it has made a perfect cardigan. I think this one will be a favourite of mine too! A narrow shoulder adjustment would probably help. If I make it a size smaller, I might not be able to wear heavier tops underneath. The red top I was wearing was quite light. I also use this on multicoloured garments, using several different colour buttons to match or clash with the fabric- it can look really cool! Thank you! I knew someone out there would have a plan. I think there might be a requirement for some button sorting in my future so I can better see what I have in the tins! Thank you! The handsewing is a bit of extra work but I think it is worth it! Excellent idea! Especially the “cookies” part! Put 7 different grey buttons on your cardigan – why do all the buttons have to be the same? Like dementedfairy I do that from time to time when I am in the mood. If the buttons were given to you by your mum some may be from your gran’s button jar so don’t give them away – they are special even if there are never enough of the same kind. Great idea! I will have to go back and take another look at my button collection, I think! I would have difficulty giving them away – I’m not sure anymore which were mine, my Mom’s, or my Gramma’s! Nice sweater! I have lots of mismatched buttons and the last time I visited Anthropologie and looked at ready to wear sweaters and tops, I noticed how many times they mix and match buttons. When they do it,it looks artsy and fabulous, so why can’t we? You could spend 2 days ‘sorting’ the buttons and you’ll be surprised how many are in fact the same. I threaded them on some topstitching thread and donated them to a craft charity – having kept the ones that appealed of course!! Lovely cardi, it suits you well. Luckily it seems you weren’t attracted to naked flames!! That’s a great pattern, and the print is wonderful! 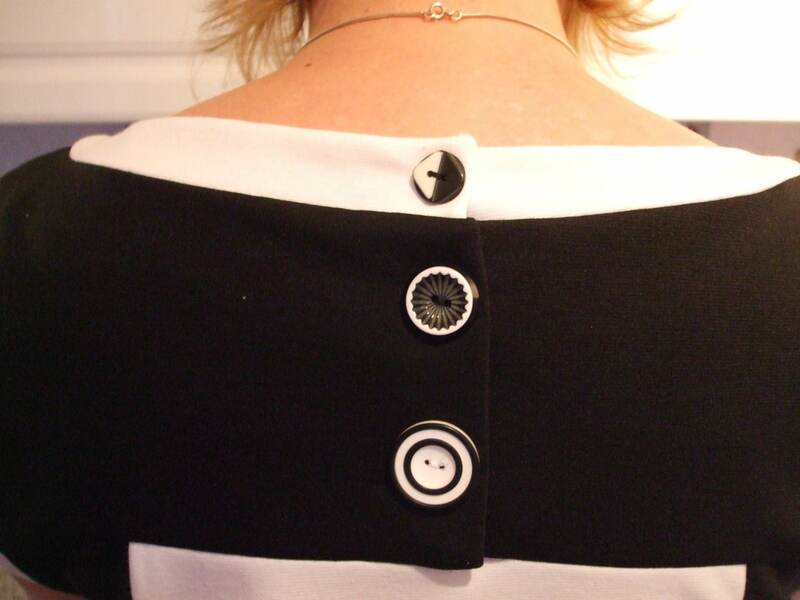 I have used special looking buttons as the first button, the used plainer ones down the front, especially with a print, and with a plain cardi or blouse, you can always use the buttons as the trim. I also like using buttons as embellishment on pillows or little bags or Christmas ornaments, sometimes on a homemade card too. Maybe one of those ideas will help you think of more ways to use them. Thank you! I do like this pattern and will be using it again. I am getting so many good ideas! I did wonder too if I had any that I could use on the next bag I am making. I am going to have to sit down and sort through them properly! I think the majority of people who sew will sympathise with your button situation. I’m another who uses mismatched buttons occasionally on a garment. Go wild! 😂 “go wild” seems to be the popular vote! If you asked Mom to pick some buttons for you out of the button box you’d have 7 buttons in no time. They might not match but they’d “do” (at least in her opinion). All kidding aside sometimes mismatched buttons look really cool. I agree! She would pick 7 random buttons that didn’t match but are “good enough”! I need a little bit more symmetry in my life though! Beautiful fabric choice for your cardi. If you come across any drop dead styles that use just one button, let me know! I have tins of interesting but lonely ones.